Four Seasons Upper Freehold – find your new home in an active adult community today! Four Seasons Upper Freehold is an 55+ / Over 55 community of 387 single family homes in Western Monmouth County. In fact, the historic borough of Allentown, which was settled in 1706, offers restaurants, antique and gift shops. Upper Freehold gives easy access to major roadways and numerous shopping venues, in addition to being close to Trenton, Philadelphia and a short ride to the Jersey Shore. Also, there are numerous golf courses in the area. Four Seasons at Upper Freehold was built between 2001 and 2004. There are 7 different models available at Four Seasons at Upper Freehold, with the various options such as loft, sunroom etc. Some have basements, however, all have 2 car garages. Sizes of the homes is between almost 1500 sq ft to more than 3600 sq ft. The association is responsible for cutting the grass and removing the new, therefore, you don’t have to! At the clubhouse in Four Seasons Upper Freehold, there are numerous activities and amenities. The clubhouse offers two card rooms, one featuring a wide-screen television, a billiards room and a crafts room Additionally, there’s a well equipped high-tech fitness center, indoor and outdoor pools and sauna. Additionally, outdoors are tennis courts, bocce courts and a putting green. 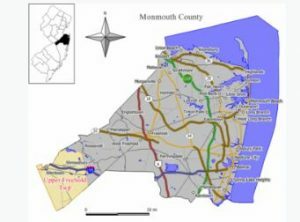 All Adult Communities in Monmouth County offer transportation services. There is a bus service from each community to local shopping centers such as malls and supermarkets. This is a scheduled service and there is no charge. There is also a medical transport bus that will take people to any medical facility or doctor’s office in Monmouth County. However, these trips must be scheduled a few days in advance and there is a minimal charge for this service. We were getting on in years. We couldn’t maintain the big house any more and decided it was time to move to an adult community. We spoke with Bunny, and we selected a few homes to see. These homes were not what we wanted, but in speaking with Bunny and Art, they quickly zeroed in on what we wanted. On the second trip, we found the community we wanted to live in. After the house in Staten Island was sold, we looked at 4 homes they selected, and one was perfect for us. They recommended an attorney, a house inspector and even a good painter, and held our hands through the entire process. We heartily recommend them. They know every adult community in the area.